Free report: Why marketing and HR must join forces for brands to succeed in finding the best people and build the best brand culture. Successful brands – cult brands – are built from the inside out. They realize that their internal audience is equally, if not more important, than their external audiences. Find out how brands like Zappos magnetically attract and engage employees through HR marketing and employer branding in our latest Viewpoint Series installment. 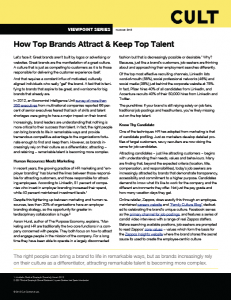 Request a copy of How Top Brands Attract & Keep Top Talent now.